If your future includes a move to Goleta, check out Meathead Movers! Our professionally trained student-athlete movers, moving concierge, and princess packers are prepared to get you safely moved into your new Goleta home. 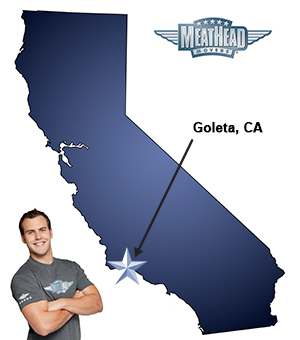 When you make your move to Goleta, be sure to contact Meathead Movers. No matter what type of moving service you need, our student-athlete movers are ready to handle all your moving needs. Whether you are moving next door, across town, or from across the state, Meathead Movers is the number one choice for Goleta Movers. We set high expectations for our Meatheads that way you can trust that they are the best in the industry. Our clean-cut, professionally trained student-athletes are the perfect answer to all your moving needs. An ideal location for college students and commuters, Goleta borders the beautiful central California coast and is a five-minute drive to the University of California, Santa Barbara campus. A short 15-minute commute to downtown Santa Barbara makes this city a prime place for those who commute to Santa Barbara for work. With a population around 30,000, it’s easy to see why Goleta’s small-town charm draws in residents. Known for its mild weather and warm winds brought about by the Santa Ynez Mountains, Goleta is great for those wanting a stable temperate climate. It’s easy to relax and appreciate the opportunity to unwind here. Take some time to explore the outdoors on one of the many hiking trails. Visit the gorgeous coastline and beaches that surround the area. Enjoy a leisurely day on the greens of Sandpiper Golf Club, or stop by the South Coast Railroad Museum to learn more about the history of the area. There’s something in Goleta for everyone to enjoy. We know how stressful moving can be, which is why we strive to make your experience as stress-free as possible. We make it our personal goal to provide you with a hassle-free, positive moving experience! Our moving company specializes in local, long-distance, and commercial moves to, from, and within Goleta. We also provide reliable packing, storage, on-site relocations, and our distinctive moving concierge service, which connects you with local service providers. All our student-athletes are drug screened, background checked and come to us through colleges like University of California, Santa Barbara. They are strong and thorough with your precious personal belongings, and even jog when not carrying your items to save you time. Experience our outstanding customer service for yourself. Give us a call today for a free, no-obligation competitive moving quote. Moving to Goleta? Here are some helpful resources. Scheduling was straight-forward and thorough. Everyone I spoke to and the student movers were professional and personable. I had to throw a number of curveballs at them, but they dealt with each and went the extra mile to make our move stress-free. Can’t praise Andrew and team enough!! Very quick and efficient. Both men were very friendly.